Are you a homemade frosting kind of person or enjoy the ease of bought frosting? I have been known to pick up a tub or two in the past, but I much, much prefer the taste of homemade frosting. (Though really, does anything beat the graham cracker and frosting treats your mom used to make with the leftover frosting? I don’t think so.) 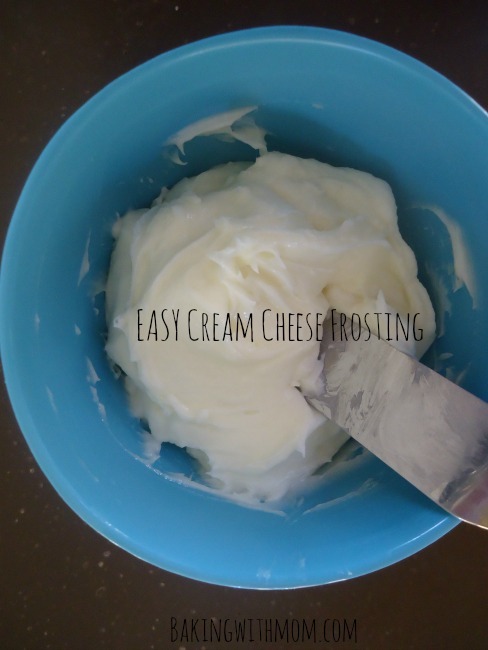 I am going to guess, once you make and taste this EASY Cream Cheese Frosting, you will very rarely go back to the tub of store bought frosting. No more last minute grocery store frosting trips for you. Yes, this easy cream cheese frosting will be a favorite of yours for the taste, the simplicity and the fact is contains cream cheese. (That’s my husband’s favorite part.) 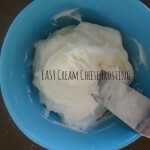 I made this cream cheese frosting on a whim the other day to go on top of the brownies I was making. It had been a rough few days and quite frankly, I wanted a treat. Good, old chocolate to change a mood around. The three ingredients you need to make this cream cheese frosting are likely to be in your fridge and pantry already. This frosting would go well on cake, cookies or homemade cinnamon rolls. And of course the above mentioned brownies. I would guess this frosting on the Brookie would be delightfully good too. Oh, the possibilities. Mix softened cream cheese and 1 cup powdered sugar with a mixer on low speed until incorporated. Mix one-two tablespoons milk in mixture and blend. Add more powdered sugar for a thicker frosting. Add more milk for a thinner consistency frosting.